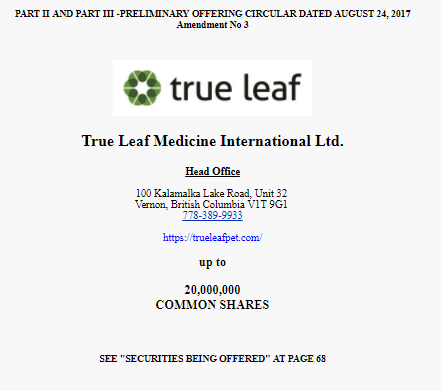 True Leaf Medicine International Ltd. (the “True Leaf” or the “company”) is a British Columbia corporation formed on June 9, 2014. We have four subsidiaries: True Leaf Investments Corp. (“TL Investments”), True Leaf Medicine Inc. (“TL Medicine”). True Leaf Pet Inc. (“TL Pet”) and True Leaf Pet Europe LLC Sarl (“TL Europe”). TL Investments, TL Medicine and TL Pet were formed in British Columbia on March 26, 2014, July 4, 2013 and November 18, 2015 respectively and TL Europe was formed in Luxemburg on July 18, 2016. We are a reporting issuer in Canada and our common shares trade on the Canadian Securities Exchange under the trading symbol: MJ, on the Frankfurt Stock Exchange under the trading symbol: “TLA”, and on the OTC Market Group’s OTCQBR Venture Market under the new ticker symbol “TRLFF”. Our head office is located at 100 Kalamalka Lake Road, Unit 32, Vernon, British Columbia V1T 9G1. Our telephone number is (778) 389-9933. Our website address is http://www.trueleaf.com/. The information contained on or that can be accessed through our website is not a part of this offering circular. Previous articleFantasy Fest Oct 20th – 29th. Key West.